Tuttle tuned ST with a set of "PD" humbuckers and tremolo! A Chambered T Model with one of Michael's Mini Hums in the neck and a "PD"Humbucker in the bridge with a vintage trem - Have Mercy !!! Has a bit of scratching on the bridge from the tremolo arm. 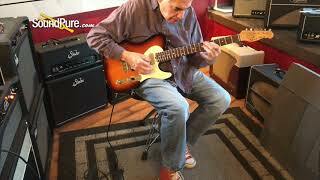 In this video, Sound Pure X specialist Eddie Berman tests out the Michael Tuttle Tuned ST Ice Tea Nitro Electric #321 with a Suhr Bella Reverb Head (Black Tolex) and a Suhr Bella 1x12 Cabinet (Black Tolex).